This post covers non-toxic window frames, sealers, flashing and coverings (blinds and curtains). Metal - Aluminum windows are the greenest, safest option. It is what I used in my tiny house (pictured left). 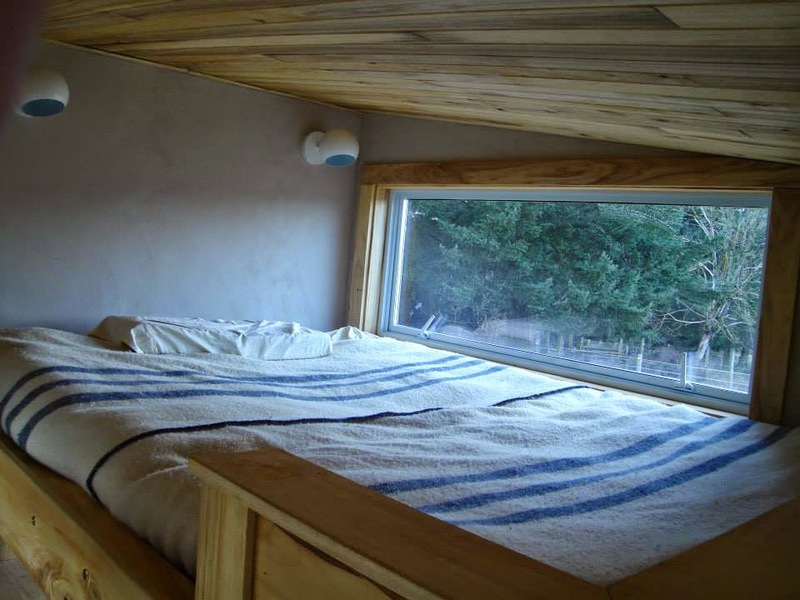 On the interior, they are framed out in wood so they appear to be wood framed windows. You can also use decorative moldings around the windows. What is used in the windows as a thermal break is blocked by the glass and metal so there is no need to worry about much offgassing. The most extremely sensitive clients can pick up the seal and some glues used. Wood - Wood windows are usually treated with fungicides. You could use a sealer that seals in VOCs like AFM Safecoat Safe Seal, AFM Safecoat Transitional Primer or Zinsser Shellac. You could go with custom wood windows to avoid fungicides, but they are more expensive and you still have to consider what kind of sealer you can tolerate on the inside and outside. For an exterior sealer see post on paints and sealers. All wood windows are not a good idea, but you can consider ones that are wood on the inside and a more weather resistant material on the outside. Consider also the glue that is used in conventional wood windows could be irritating for the sensitive person. Fiberglass - Fiberglass offgasses VOCs and some sensitive people do report reacting to it. Though it may be tolerable for many. Vinyl - Vinyl is generally not healthy, but since this is a hard plastic, many very sensitive individuals report tolerating it. I did not pick up any offgassing on the vinyl windows I tested (and use), I can pick up the offgssing in some of them under one year old. Ohers have reported reacting with brand new ones. Personally, with a bit of time to offgas I find these to be good. Gas filled - Windows filled with argon or krypton gas have a higher insulative value and both gasses are considered non-toxic. Silicone - My top choice for caulking was Eco-Bond (Which is reported to be out of business as of late 2018), but I review a few different options in this post. Sealing around windows and doors - Wool products can be used instead of polyurethane foam. Or plastic backer rod can be used. This is non-toxic and odourless. For zero-VOC window flashing use TYPAR AT. They do not recommend this being used in the rough openings, and it doesn't fit all building codes. Screens - Conventional screens are very smelly at first. They can be left outside to offgas, or aluminum screens can be used instead. Marvin is one brand that makes the aluminum options. Fabrics - Fabric curtains are usually treated with wrinkle-free chemicals and flame retardants. Natural fabrics do break down in UV light but are a better option. Blinds and Shutters - Green versions include naturally finished wood shutters, metallic Venetian blinds, and bamboo roll down blinds. Between the Glass - Between the glass is a really cool option. Here is an example. 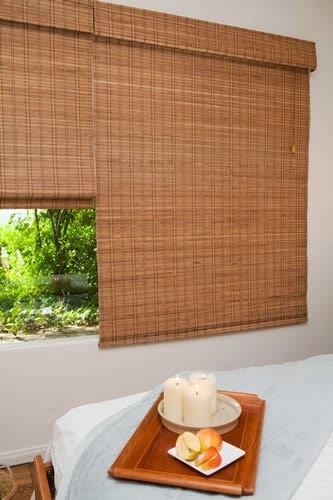 Blinds Chalet blackout liner on the bamboo shades is PVC- free and they claim that it is environmentally friendly. West Elm 100% polyester curtains still have that new fabric toxic smell but will offgas. These polyester curtains do not contain flame retardants, can we washed and aired out and should be tolerable after washing and airing for most people. Earthshade makes eco blackout shades and rollers that are probably the safest ready-made option on the market. Another option to consider is this paper black pleated shade - the company claims in an email they do not give off any hazardous chemicals (I use the natural colour version of this - it has a slight toxic smell and needs to be offgassed for a little while). Another really safe option (truly the safest) would be to make your own blackout curtains with pesticide-free hemp fabric. IKEA curtains made with 100% cotton are somewhat light blocking and may need to be washed or aired out depending on your sensitivities. Avoid vinyl roller shades and vinyl miniblinds, PVC and conventional blackout curtains. What I read right now had all relevant details about eco-friendly windows and their covers. I have been using vinyl windows, which I got replaced last year in Toronto. I love them because they help me keep my interiors warm during winters. I am planning to change my bedroom windows in a week. Now, what I want to know is what advantage will I have if use wood windows? Where do you find Aluminum windows with the baked on enamel? What brand name? Hi, I believe you can special order from home depot or other window supplier. Should be fairly easy to find. Just ask about the finish and make sure there is no vinyl. Don Young windows in San Antonio TX manufactures one of the nicest aluminum windows I have seen. The website is a little dated. Also, Milgard I believe has a nice baked on enamel finish aluminum window. Hello! What do you recommend for renters? Should we run the risk of being billed by installing entirely different window coverings altogether? I want to do so much to change what my little one's are exposed to. I'm just unsure how to go about it as I do not own my home and it use to be military housing so lead paint was used in my home, though sealed. I appreciate any recommendations you have to offer! Thanks! Can you talk to them about what you would be allowed to do? The paper ones would be easy to take down. Or can you swap out curtains and put the old ones back? Hi there! I loved this article. I recently emailed a manufacturer to ask about my blackout shades and got this response: The Sound Asleep™ Blackout Window Curtain Liner does NOT contain any PVC/vinyl, phthalates, BPA, lead or flame retardants. It is made of 100% Polyester with a foam lining which is polypropylene acid ester/titanium oxide." Based on that, do you think the product is still toxic... and should be replaced? I'm thinking of getting an Earthshade product but wanted to ask your thoughts. Thanks! This sounds generally non-toxic, however I am wondering if the polyester is glued to the plastic. For the extremely sensitive the plastic will also have a smell. I would judge this product based on how it smells to you. Thanks so much! In general, neither my son nor I seem sensitive to the material, but I'm working on phasing out toxins in the home and wanted to be thorough. I think our solution will be to get an Earthshade roller (on rails - so it blocks out as much light as possible) and keep the darkout curtains to pull around the edges. Yes, I have heard they can be hard to source. I got mine in Vancouver, Canada. Thank you for this useful information! Could you please share where in Vancouver you found your aluminum windows, or the manufacturer? I have been able to find powder coated, but not baked enamel. I got my windows from DYG. Powder coated and baked enamel should both be tolerable. I see that you recommend "between the glass" window coverings and link to the Pella Designer Series wood windows. How do you feel about the windows themselves? They have wood, fiberglass and vinyl, the same precautions would apply as mentioned in the post. I have not tested this brand. It was more an example of between the glass window coverings. Thank you for your excellent website! You recommend aluminum or steel windows. However, there is a lot of info out there about condensation gathering on metal (due to the way it conducts the cold from outside, which produces condensation when it meets the warm inside air). And...where there is condensation, there is often mold or mold potential. (The mold seems to grow on any wood, drywall, etc. that the water drips onto--not, obviously, on the metal itself). Any suggestions to avoid this? Thanks! The ones for houses (not RVs) contain a thermal break. I did not have condensation on mine. Hi there I bought 100% poliester blackout curtains for my baby room. And I am wondering how safe they could be in the nursery. They have very distinct smell and I afraid to put them in the nursery since they will be above the heat vent. Do you think they might start to spread toxins in the room? Hello. You speak about aluminum for windows being a safe option...but what about the aluminum blinds? Are they a safe option? It's also a good option to buy curtains , sheets or material at the thrift store or second hand else where to make your own black out window shades. I have fibromyalgia and bad chemical sensitivity so I use a lot of second hand materials. That can work for some, I would not be able to use second-hand Fabrics to to contamination. Hi, Do most shades contain flame retardant? I've been removing those cellular shades from my house because I assumed they did? Probably do. What are they made out of? You could ask the company if you know where they are from if they are compliant with flame resistant standards. Many polyester items have flame retardants on them.